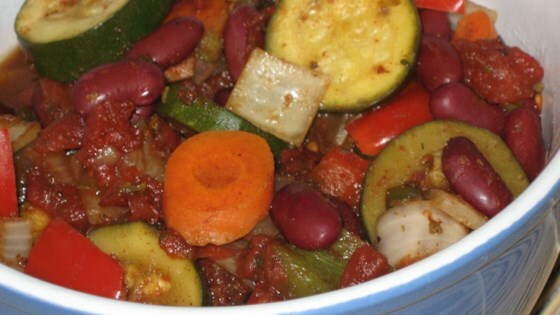 "This is a very zesty and hearty chili recipe loaded with vegetables. Garnish with sour cream and cheese, if desired, and serve with herb toast." In a slow cooker, combine the tomatoes, garbanzo beans, zucchini, onion, carrots, celery, red bell pepper, green bell pepper, chili powder, green chile peppers, garlic, oregano, cumin and salt. This was good but had a little too much chili powder. My husband and I enjoyed it mixed with white rice. Very tasty when served over rice. The longer you cook it the better it taste. Original recipe is pretty good. I used crushed tomatoes for a thicker more chili like consistency. And corn instead of zuccini, personal choice. A very tasty recipe. A lot of vegetarian chili's lack in taste, but this recipe comes the closest to capturing the true chili taste.